Did you know that Muslims also venerate Mary? That they, too, believe in the Immaculate Conception? 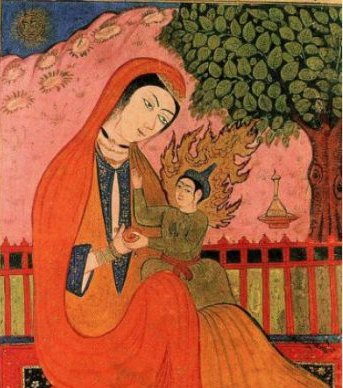 That the iconic Muslim prayer posture is connected to Mary? And most amazing of all, that it was no coincidence that Mary appeared at Fatima in Portugal? We should definitely take note of this, especially given the decline of Christianity in Western Europe. Christianity’s attempts to convert Muslims — even Saints Francis of Assisi and Ignatius of Loyola were stymied in their attempts — must be largely considered failures. Why might this be? Here’s part of the reason. A Muslim converting to Christianity, at least from the Muslim’s point of view, would be much like a Christian converting to Judaism. Muslims believe that they have the final and definitive revelation of God to the world, that Jesus was only a prophet announcing Mohammed, the last of God’s real prophets. Though becoming Christian might seem like a step backward for them, Mohammed is merely a prophet of Allah and not Allah, himself. Jesus, however, is both God and man. Therefore, Islam is, in effect, a step backward from Jesus to John the Baptist, the last of the prophets. Mary holds an exalted place in Islam as the only woman named in the entire Quran. (2) It refers to Mary seventy times and even names her as the greatest of all women. Though rejected by many Protestants, especially those descended from John Calvin, Marian doctrines such as her Immaculate Conception, Perpetual Virginity, and Assumption(3) are wholeheartedly endorsed by the Quran. The nineteenth chapter of the Quran alone contains forty-one verses on Jesus and Mary. It makes such a robust defense of Mary’s virginity here that in the fourth book of the Quran, the condemnation of the Jews is attributed to their calumny against the Virgin Mary. Specific passages and details included in the Quran hint that Mohammed’s source text might have been the apocryphal Gospel of Mary’s birth. Both texts described the old age and sterility of Saint Anne, while Saint Anne is not even mentioned in the Bible. The Quran even quotes Saint Anne as saying, upon the Immaculate Conception: “O Lord, I vow and I consecrate to you what is already within me. Accept it from me.” And further, upon the birth of Mary, Saint Anne exclaims, “And I consecrate her with all of her posterity under thy protection, O Lord against Satan!” This appears to be a reference to Genesis 3:15, in which God prophesies that a woman will come who will be, from her beginning, an enemy of Satan. Above all the women of the earth! This is similar to Elizabeth’s address of Mary, “blessed are you among women and blessed is the fruit of your womb.” It also reinforces (and in effect proves) Mary’s own statement: “All generations will call me blessed.” When Mary said “all generations,” isn’t it amazing that her statement should extend beyond Christianity? To two world religions? To the Muslims, the Blessed Mother is the true Sayyida, or Lady. The only serious rivals to Mary would be Mohammed’s daughter, Fatima, and his wife, both of whom are numbered along with Mary as the four greatest women in Islamic history – interestingly, Mohammed’s mother is not on this list. At least two more Marian titles derive from the beautiful gesture of prayer. These are Rāki’ah, which means “She who bows down to God in worship”, and Sājidah, “She who prostrates to Allaah (God Almighty) in worship.” The Quran states: “O Mary, you shall submit to your Lord, and prostrate and bow down with those who bow down.”(8) According to some Islamic scholars, Ruku’ (bowing down) in Salaah (Muslim prayer) during prayer has been derived from Mary’s practice. In this motion, the hands, knees and the forehead of the worshipper touch the ground together. 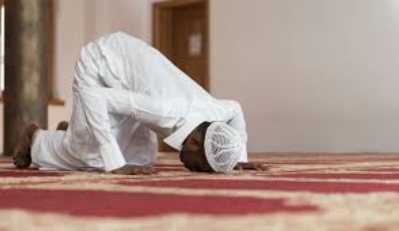 This is the humblest position one can be in before his Lord, the sincerest sign of humility and surrender to the Creator. Isn’t that amazing? The very posture of prayer and supplication, which so defines our conception of Muslims, is actually derived from the Virgin Mary! With regard to the title Mustafia, the Quran records the angels as singing: “O Mary! Lo! Allah hath chosen thee and made thee pure, and hath preferred thee above (all) the women of creation.”(10) It makes you wonder why Allah preferred Mary above all other mothers, even Mohammed’s. 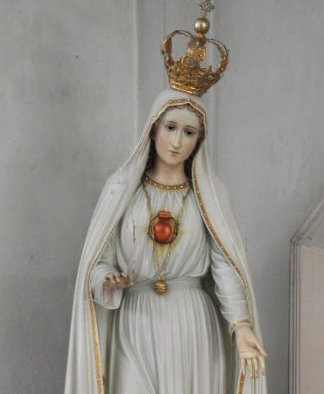 Why Did Our Lady Come to “Fatima”? Sheen cites the auspicious history of the village of Fatima as evidence for Mary’s “pledge”. 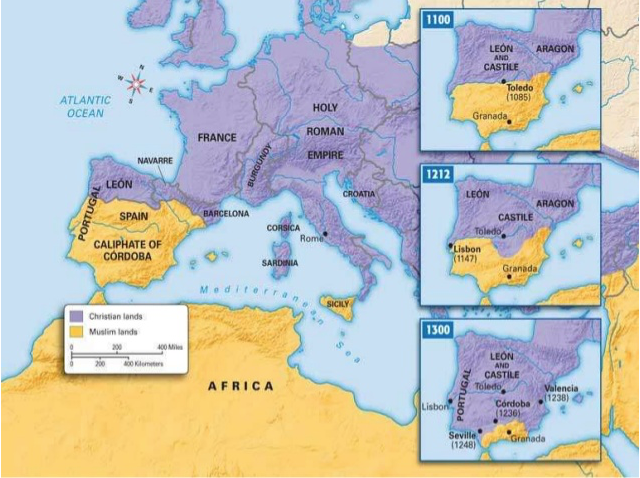 Muslims, specifically the Moors, had occupied the Iberian peninsula of Portugal and Spain for centuries. The Umayyad Caliphate completed its conquest of Iberia in AD 711. 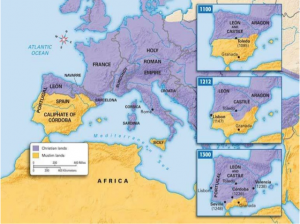 Christians began the long slog of reconquering the peninsula with the Battle of Covadonga in 718 and would not retake their lands for another 700 years, when Ferdinand and Isabella completed the Reconquista in 1492, the year of Columbus. The young husband was so much in love with his wife that he changed the name of the town where he lived to Fatima. Thus, the very place where Our Lady appeared in 1917 bears a historical connection to Fatima, the daughter of Mohammed. For further evidence of Mary’s purpose in choosing Fatima, one need look no further than the faces of the pilgrims to Fatima, themselves. “In Harissa, Lebanon, Iranian women constantly come to pray to Our Lady, to the point that the rector of the shrine has a chapel prepared especially for them, with icons, signs and prayers to the Virgin in Persian, to facilitate their devotion. Popular devotion to these appearances of Our Lady, as well as to Saint Charbel Makhlouf of Lebanon, is growing among Muslims, much to the chagrin of radical Islamists. This is why ISIS and groups such as these destroy pilgrimage sites whenever possible. Pray for the conversion of Muslims! (1) Sheen, Fulton, The World’s First Love, McGraw-Hill Book Co., Inc., New York (1952): 205-6. (2) The Quran (sometimes spelled Koran) is the bible of Islam. (3) Lings, Martin, Muhammad: His Life Based on the Earliest Sources, Inner Traditions (rev. ed. October 6, 2006, orig. 1983), p. 101; an example of an Islamic scholar which accepts the Assumption of Mary as an historical fact. (4) cf. trans. Arberry and Pickthall; Stowasser, Barbara Freyer, “Mary”, in Encyclopaedia of the Qurʾān, General Editor: Jane Dammen McAuliffe, Georgetown University, Washington DC. (6) Mary is called this in sura 66:12. The Arabic term means constant submission to God and absorption in prayer. These meanings coincide with Mary spending her childhood in the temple of prayer. This is likely based on a reference to apocryphal texts, but it is amazing how it supports her being the New Ark in the Temple of God. (11) Following her marriage, the princess received as prize the town which she called Ourém, after her name. Ourém remains the name of the municipality which contains the cities of both Ourém and Fatima.